There is no middle of the road when it comes to this vegetable. You either love Brussels Sprouts or you don’t. But if you would trust me on this one, you’ll find that this is the recipe that will change your mind if you’re not a fan of the little leafy bulb. Prepared much like the cabbage for Coleslaw, this Brussels Sprouts Salad with Dijon Horseradish Vinaigrette will introduce you to a brand new and incredibly delicious way to experience the vegetable that is generally sautéed or roasted. Years ago, in our great-grandparents generation, the Brussels sprout had a much more bitter taste. But with new farming and breeding techniques, the bitterness has decreased while the nutrient value has increased, spurring a renaissance in production and consumption of the “new” better-tasting Brussels sprout. For this recipe, we have Chef Ryan Clark, the executive chef of Agustin Kitchen in Tucson, to thank. Chef Clark, a three time Iron Chef winner, two-time World Margarita Champion, and author of “Modern Southwest Cooking,” prepared this salad for a Fall Festive Entertaining event at AJ’s Fine Foods in Tucson this month, and the dish absolutely wowed the crowd. 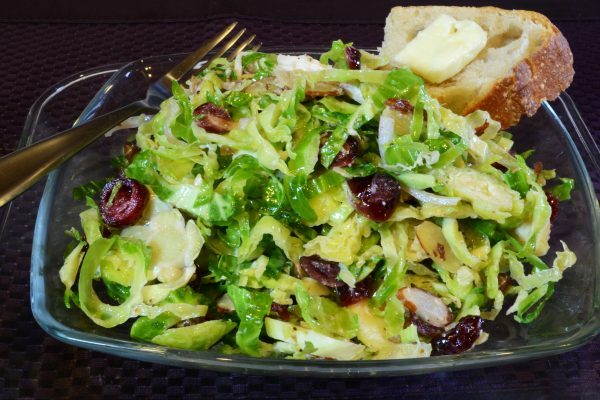 With the holidays upon us, Chef Clark’s Brussels Sprouts Salad is the perfect make-ahead dish for a large gathering. It is also a wonderful side, or even a main meal salad when served with hearty fresh French bread and butter! By the way, I’ve been fortunate to host the AJ’s Festive Entertaining Series for 3 years now. Our final event is November 15th at AJ’s at 44th St. and Camelback. Stop by and meet top chefs like Ryan Clark. Again, if you trust me on this one, fresh shaved Brussels sprouts salad with this sensational vinaigrette will be a brand new favorite! Discard any loose leaves from the Brussels sprouts. Holding the stem, cut the Brussels sprouts into very thin slices. Toss in a large bowl to separate layers. In a dry skillet, lightly toast sliced almonds. Place in a plate or bowl to cool. To the Brussels sprouts, add toasted almonds, cranberries, dates, shallots, fresh grated cheese, salt, and pepper. Pour Dijon Horseradish Vinaigrette over salad and gently toss. When plated, sprinkle small amount of shaved cheese over top. Whisk or blend all ingredients together until well combined. Pour over salad and toss.